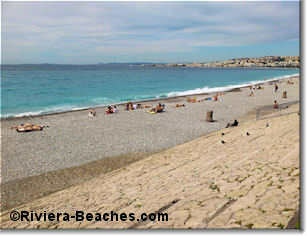 The long Ponchettes public beach stretches from Opera beach in the west to Castel in the east and contains a sandy beach-volleyball court. Although it's a hike from a bus stop, Ponchettes is the closest beach to Nice's Old Town and is within easy reach of dining and snacking options. After a game of volleyball of course. Ponchettes is also a no-smoking beach. The closest hotel is the classy Hotel La Perouse a short walk east. The nearest bus stop is Tour Bellanda where you can pick up line T32. For more choices, head west to the Jardins Albert 1er bus stop at Centenaire beach. There are a number of options just across the Quai des Etats-Unis: the bar-pub, Obsession; Sun Sea Blue has something for everyone from pizza and snacks to full meals and ice cream cones. There are no public facilities except for the portable toilets that appear in July and August. 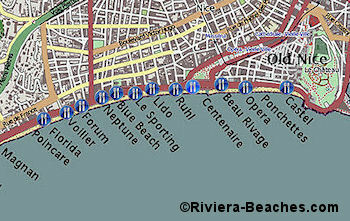 Otherwise, walk west a few blocks to Beau Rivage beach where you'll find public showers and toilets. There's no street parking here but there is paid parking at nearby Parking Sulzer. Ponchettes has a lifeguard and first-aid station from mid-June to mid-September. In fact, it's the headquarters for the whole first-aid system. See more about lifeguards.